The Name field allows entry of the final bookmark name, as it will be displayed on the Bookmarks menu. You should choose a name that conveys (to you) the usage of this location. Bookmarks may be built in a hierarchy, similar to the tree shown in the Folders pane, through use of the New Folder… button. Bookmarks, therefore, may be created on any level (ie. in any subfolder) which exists. Clicking this field (or the drop-down button) opens a list which shows all current levels; the user may select which folder or level to create the new bookmark in, as in the image. This dialog creates a subfolder in Bookmarks (the root level for user bookmarks), or within any other bookmark subfolder which currently exists. Note that folders may contain bookmarks, but do not have a bookmark associated with them. Creation of a new folder (ie. one level below Bookmarks) is fine, but creation of second folder within the first (ie. two levels down) causes the folder names to be displayed incorrectly on the Bookmarks menu. All subfolders past the first level are shown with the same name - the name of the lowest level. Workaround: The Organize Bookmarks dialog displays the bookmark hierarchy and folder names correctly. During creation of a new folder on the same level, Explorer++ does not check for duplicate names. See also - fatal error (bug), when deleting empty bookmark folders. Normally, this field shows the URL (ie. location) of the currently active folder in the Files pane, but you may edit it as desired. Make sure that the location you edit actually exists. Any bookmark with no location (ie. empty string) will open in the default new tab folder. Checking this box (or menu item) forces the bookmark created to be shown on the Bookmarks toolbar. 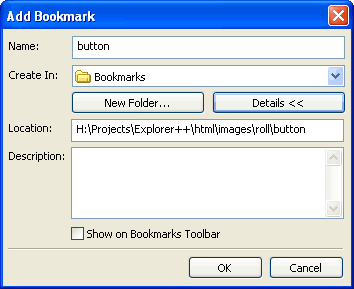 If this box is not checked at the time of bookmark creation, it may be checked later as part of the Properties dialog in the Organize Bookmarks tool. Folders housing bookmarks may also be designated to show on the Bookmarks toolbar.